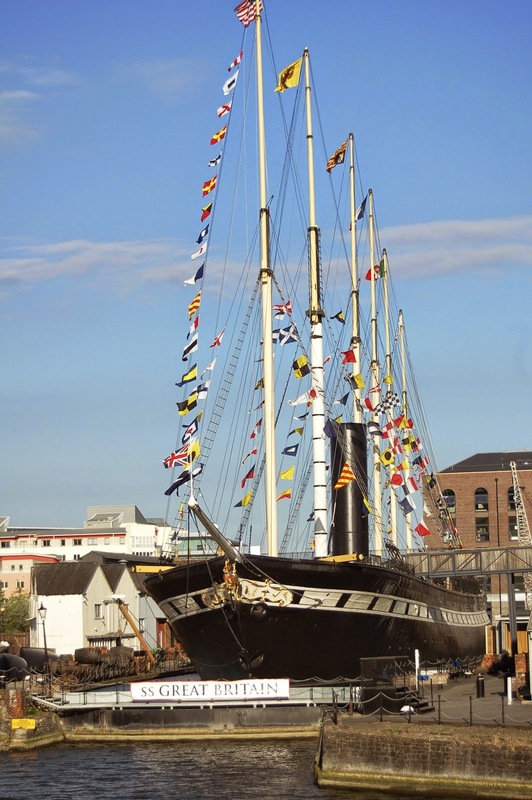 Exploring Brunel’s ‘SS Great Britain’ museum ship and former passenger steamship, set in Bristol’s historic dockside allows visitors to step into the shoes of a Victorian sailor and climb the huge mainmast (while strapped into a harness) in the attraction. Go Aloft! We got a warm welcome from the ferry crews who took us from Temple Meads Quay to the SS Great Britain through Bristol’s historic harbour…sheer delight! The location is very charming with full visitor reception and well laid out site aka the massive ship in the original dry dock in which she was built and is now resting and its conservation are impressive in their own right, but the presentation and interpretation make it accessible and fascinating. The separate museum is alongside and full of diagrams, models and working exhibits. The themes of technological innovation and social history run through the exhibits and made for a great experience for me and I would say it’s worth a trip to Bristol on its own. The flow of the visit – ‘underwater’ view, museum and then the ship itself, is amazingly effective, the audio guides work well, and we also loved the opportunity to climb the rigging and go out a yard in the end (at a height of something like 100 feet over the deck - but with a safety harness!). It is truly a fascinating ship with lots to see and do. Imagining the long crossing to Australia cooped up in cattle class is an eye opener, the more senior members of the crew did not exactly have a luxurious crossing. My favourite bit was going below the ‘water line’ to see the hull and visit the really cleverly restored decks within the ship with everything in place that gave the flavour of a voyage in the first large ship to cruise the oceans in total luxury with a moving massive steam engine amid ships. This really was an unexpected treat , though I had been told by numerous people how good it was but as always one wonders how much hype is involved, and now even I Highly this wonderful attraction as you can actually walk in the footsteps of the early mariners and passengers. You are not looking at the ship from behind a glass screen, but actually walking, sitting and standing on and below the decks. As I mentioned above, for the more adventurous, there is an opportunity to climb the rigging. Absolutely realistic and interesting! First class travel these days, is nothing like the era people sailing on the SS Great Britain experienced. The working model of the turbine engine is terrific and so interesting, along with all the artefacts that were found on the ship…so if you are in London to make a trip to Bristol just for this! Go Aloft people! AMRELI...COMFORT FOOD AT ITS FINEST!